While WSA delivers amazing tours for students and young backpackers abroad in Europe, we also recognize that parents need some peace of mind, too! Here's what we can guarantee with every WSA experience. You can also find that our student reviews have earned us a five-star rating on TripAdvisor. Europe is a safe place. Statiscally, it's safer in just about every aspect than the USA. That's not to say worries are unfounded, so we've taken every precaution possible to ensure the safety of all our tours members throughout their travel with WSA. Local and Responsible Tour Guides: Every one of our tours is led by a professional, passionate local guide who speaks the language and knows these cities like the back of her hand. Three WSA Contacts On Call 24/7: Include Tour Guide, Local Contact Back-Up and the WSA Office staff. Key Local Address and Contact Information: Each WSA tour handout includes information for the US Consulate, closest English speaking Hospital and the group's Hostel address and info. CPR Training: WSA guides are encouraged to be certified. We re-evaluate and improve our safety measures at our annual guide summit where all our local guides come in and share tips on the lessons and tips they learned during the previous season. Students often tell us they learn a ton on our trips and have a blast while doing it. Our trips help students learn more than they could ever expect about the cities they are visiting. We break through the checklist mentality and get students beyond snapping pictures of the Eiffel Tower or the Colosseum to really teach them about the history, culture and important events in each of these cities. WSA trips are structured to pack in a ton of experiences yet at a relaxed pace. WSA and Local Culture: WSA plunges our students into the local culture encouraging them to try new cuisine, covering current events and important topics, and getting students off the beaten track to truly experience of these world-class cities. We've found that connecting to culture is the richest, most rewarding part of any travel experience, so we've made it a priority to get students knee deep in it! WSA is fortunate to benefit from the over 20 years of travel experience that Andy Steves brings to the table. His background of traveling, working and studying in Europe gives WSA crucial expertise and important connections in every single destination. 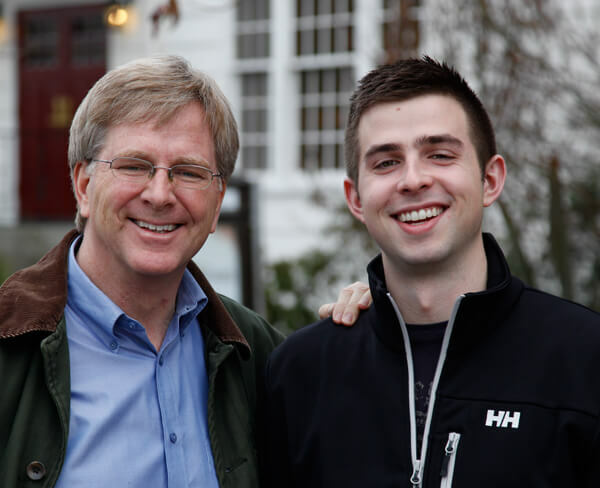 For a number of years, Andy has uploaded his blogs on his dad's site at RickSteves.com and also worked as a tour guide for Rick's company, Europe Through the Back Door. WSA helps parents sit back, relax and enjoy their student's adventures by living vicariously through photo albums, blog entries, tour videos and more. Parents of students who enjoy our trips gain peace of mind knowing their loved ones are traveling with organized, responsible and knowledgeable staff from an insured and licensed tour company. "I think education abroad is necessary and important. It broadens horizons, teaches cultural tolerance, and opens young minds to a big world filled with infinite possibilities. Working to enhance and improve all aspects of study abroad opporunities for future generations of students is a worthy cause." After traveling every summer while growing up with his family, Andy then began traveling, working and studying independently across Europe to develop his own unique style and travel philosophy. Check out his father's philosophy here, and Andy's here. Guarantee peace of mind, quality and unique cultural experiences for your students with a WSA gift card! Learn more by getting in touch with us here.